1 Monty: We need to get to Paris quickly. Colonel Haken would have taken his zeppelin again. 2 Prof. Jones: We need our own airship so that we can follow them without losing time. Trace their path precisely through the skies. 3 Monty: So we'd be on some sort of led balloon? 4 Prof. Jones: Yeah; I guess that wouldn't go down so well. I did a bit of research and apparently in Commonwealth English the phrase is "go down like a lead balloon", whereas in American English it's usually stated "go over like a lead balloon" for some reason. I don't pretend to understand these things. I just present them to you. And no, there is no Led Zeppelin reference in the comic. Because that's what people would expect! Comedy is all about doing the unexpected. By the way, did you know that Led Zeppelin took their name from the "going down like a lead balloon" saying, after early reviews of their band were poor? No, really. 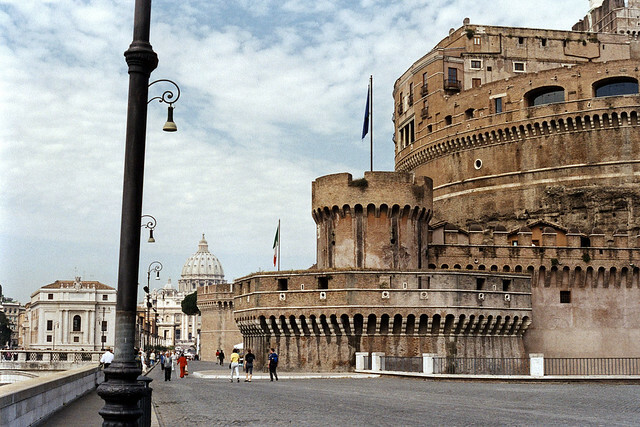 2018-09-21 Rerun commentary: The background photo is Castel Sant-Angelo, which really is just a short walk from the Vatican (which our heroes have just left). So the geography here is correct. The photo is one I took myself back in 2001. On film.